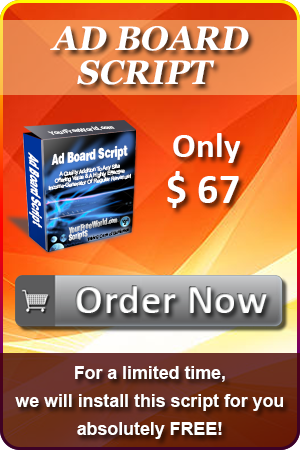 Marketing scripts are always popular and Ad Boards are no exception. 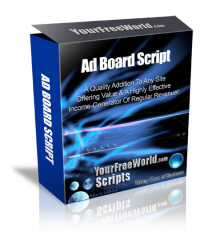 Instantly giving you the ability to offer free and pro membership plus premium advertising and banner impressions for a fee, our Ad Board script adds value to your site and makes it 'sticky'. 'Sticky' sites encourage members to return on a regular basis, allowing you to show them your own promotions every time. Ad Boards are highly trafficked sites - thereby increasing the popularity and page views on your web site. Your advertisers will be able to see real-time stats of impressions and hits at-a-glance. You can also sell banner impressions to site visitors in top and bottom positions as an extra source of income. With this script, you can build a quality list of double opt-in subscribers to market your offers to. This script is easy to install and comes with Free Installation, so if you need any help installing the script, we will gladly install it for you at no extra cost. And the best thing is... if you buy this script now, you'll only pay $67. Choose between Free, Pro or both membership styles. Set the membership fee for Pro members. Set the duration of the membership fee to monthly, yearly or lifetime. Set the frequency and quantity of ad postings by members. Allow or disallow random referral for Pro members. Set referral rewards for Free and Pro referrals. Set the minimum payout figure. Set the price for top and bottom positioned banner impressions. Set the price and duration of premium advertisements. Ability to include your YourFreeWorld affiliate ID in web site links. Paypal, Payza and Moneybookers compatible and you can also add 5 more merchant accounts of your wish.